If you have to have a major operation, you take it for granted that supplies of blood will be readily available if you need a blood transfusion. That only happens because of the generosity of people who donate blood – there are an amazing 85 million donations of blood each year all over the world. About 65% of all blood donors are from western industrialised countries, the so-called ‘developed’ world, where just over a quarter of the world’s population live. That leaves the rest for the 75% of the global population who live in developing countries and it means that people in developed countries are 16 times more likely to give blood than those in poorer countries. The 85 million blood donations take place in fewer than 10 000 specialised centres, which are spread between the different countries. Each year, centres in wealthy countries take about 14 000 pints of blood, while centres in developing countries, such as African and Asian countries, take less than half that during the same time. These figures seem impressive but when you realise that, in wealthy countries like the UK, there are only 38 pints of blood donated each year for every one thousand people in the population, you can see there is still a great deal of room for improvement. The figures in developing countries are worse – in the poorest countries, only about 2 pints of blood are collected every 1000 people. If every country in the world could persuade between 1% and 3% of its population to donate blood once a year, the blood supply for every county in the world would be sufficient to meet demand. In the UK and 56 other countries, donated blood comes from people who volunteer to give their blood free – they are not paid for doing this. This is not true in all countries and the sale of blood can lead to dubious standards and poor practice. In about 42 countries, less than a quarter of all blood donations come from people who give their blood voluntarily. Since the World Health Organisation began to promote World Blood Donor day back in 2004, over 100 countries have managed to increase the proportion of their blood donations that comes in from volunteers. World Blood Donor day was first held in 2004 and it was the decision of the 58th World Health Assembly to create this annual event. The day is celebrated on June 14th every year and it serves to raise awareness all over the world of the urgent need for more blood donation. In 2010, the theme of World Blood Donor day is ‘Young Donors’ and events are being planned to encourage younger adults to think seriously about becoming a regular blood donor. Young people can provide good, healthy blood and can help boost the supply of blood in all countries. Various infectious diseases are blood borne – the infectious agent that causes the disease is carried in the blood and can be transmitted from blood donor to blood recipient. Several important viruses are carried in the blood including HIV, and the virus that causes hepatitis. Syphilis, which is not a viral disease, can also be passed on in blood. In 2007, 41 out of 162 countries in the world still did not screen all their blood donations for these important diseases, so are still putting people who receive blood transfusions seriously at risk. The first blood transfusion took place back in 1665 when a doctor called Richard Lower transfused blood from one dog to another. This worked fine but when he and others tried it in people, they managed to kill quite a few of their patients. It was not until 1900, nearly 250 years later, that Karl Landsteiner discovered that humans have four separate blood groups and giving someone a blood that doesn’t ‘match’ can be fatal. It is now common to know your blood type – which can be O, A, B or AB. 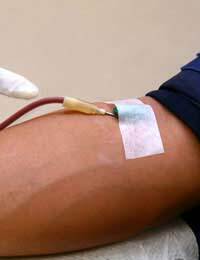 Globally there are around 52 000 hospitals that carry out blood transfusions routinely. These are located across 120 countries and provide healthcare for 3.6 billion people. In the UK, transfusions in hospitals use up around 8000 units of blood each day. They are used to replace lost blood in accident victims and to replenish the blood lost in major surgery, such as heart transplants, liver and kidney transplants, limb amputations and sometimes when excessive bleeding occurs following the birth of a baby.